3. Credit - or blame? Japan surrendered shortly after this A-bomb obliterated Nagasaki on Aug. 9, 1945. On Aug. 6, Hiroshima was the first city destroyed by an atomic weapon. By then, Edward Teller had been thinking about the vastly more powerful H-bomb for four years. To understand the difficulty of inventing the H-bomb, take a mental journey to 1945. Atomic ("fission") bombs have just closed World War II with a double-bang. For more than two years, Los Alamos, New Mexico has been world headquarters for physicists, home to the intense intellectual debates and frantic engineering needed to build the atomic bomb. But the exhilaration at Los Alamos is soured by the realization that the "project" has killed more than 100,000 people and forever tipped the military balance toward offense. A week after Nagasaki, Manhattan Project leader J. Robert Oppenheimer is "guilty, weary and depressed, wondering if the dead at Hiroshima and Nagasaki were not luckier than the survivors, whose exposure to the bombs would have lifetime effects," wrote Richard Rhodes in his history of the hydrogen bomb. The leaders of the bomb project write that "the safety of this nation... cannot lie wholly or even primarily in its scientific or technical prowess. It can only be based on making future wars impossible" (see p. 203, "Dark Sun... " in the bibliography. While Los Alamos continues working on the atomic bomb, and takes faltering steps toward a hydrogen bomb, many physicists, satisfied that their goal is met and uncertain about building a hydrogen bomb based on the vastly greater energy of fusion, return to their universities. Fission ("splitting") occurs when the nucleus of large, unstable atoms, like uranium and plutonium, break into smaller atoms, releasing energetic radiation and neutrons. Fission powers the "atomic" bomb that destroyed Hiroshima, and all nuclear power reactors. Fusion ("joining") occurs when light atoms, primarily isotopes of hydrogen, fuse into larger atoms, releasing fantastic quantities of energy. Fusion powers the sun and "hydrogen" bombs, which are called "thermonuclear" for the intense heat needed to overcome electrical repulsion between positively-charged hydrogen nuclei. Fusion, however, is extremely difficult to control; although billions have been spent to tame fusion for electricity, practical reactors are decades away. In bombs, the two forms of nuclear energy are often blended. Most fission bombs are "boosted" with fusion fuel. All fusion bombs are triggered by fission bombs, and most contain a second fission bomb, called a "spark plug." In 1946, Edward Teller departs for the University of Chicago. One of several brilliant Hungarian refugees who contributed mightily to the atomic bomb, Teller had earned his Ph.D. under the eminent German physicist Werner Heisenberg and moved to the United States in 1933, after the Nazis took power in Germany. While the Manhattan Project tried to tackle first things first, Teller dwelled on fusing two isotopes of hydrogen --deuterium and tritium. (Isotopes are atoms that are chemically identical but have a different neutron count and different masses.) "Even during the war he was troublesome," says physicist Herbert York. "He wanted to work on fusion, but the job was fission, and he quit in a huff several times." Under earthly conditions, electrical repulsion prevents hydrogen nuclei from fusing. In the sun, however, enormous gravitation squeezes hydrogen nuclei until they fuse into helium. Gobs of energy are released when a bit of their mass is converted to energy according to Einstein's famous equation, E=MC2 (Energy equals mass times the speed of light, squared). Scientists had known since the 1930s about fusion in the sun, but fusion refused to be "tamed" into a bomb on Earth, and even after the war, fusion was not the focus at Los Alamos. Then the Cold War intensified: The 1948 Berlin blockade, the 1949 Soviet atomic bomb test, and the start of the Korean war in 1950 created new political realities. In 1950, President Harry Truman made the H-bomb a national priority. In June, 1950, however a long series of calculations proved that Teller's super design would fail. The calculations, made in those pre-computer days with slide rules and mechanical calculators, were incredibly complex, says Carey Sublette, author of Nuclear Weapons Frequently Asked Questions and operator of the Nuclear Weapon Archive website. "There are a lot of processes involved that could pull the outcome in different directions, and all are significant, so you can't simplify the problem by assuming things away, as you frequently can do in science .... Very complicated computations were needed to chart what was going to happen." The answer, delivered by mathematician Stanislaw Ulam, was that the fusion fuel would either not start fusing, or the fission trigger would blow the fuel apart too soon. Then, in January, 1951, Ulam, who had immersed himself in matters thermonuclear, suggested using energy from the fission bomb to compress, not heat, the fusion fuel. Although Teller had long argued "compression does not matter," Ulam realized, according to Rhodes, that "Compression works in thermonuclear fuels in much the same way it works in fission fuels, squeezing nuclei closer together and therefore improving their chances of interacting" (Dark Sun, p. 464). Compression also makes the fuel easier to heat with thermal radiation and slower to cool, Sublette adds. Although Teller soon scented success, shock from the atomic bomb might not compress the fuel evenly, and the secondary might still be destroyed too soon. So Teller built on Ulam's idea by suggesting that the compression could come from thermal X-rays from the primary bomb, not the shock wave. The different was subtle, but critical. Radiation moves at the speed of light, much faster than a shock wave, and radiation can be directed to compress the fuel evenly from all directions so quickly that fusion can occur before the shock wave destroys the secondary. Teller then contributed another idea: placing a "spark plug" of uranium or plutonium in the center of the fusion stage. The spark plug, compressed by the radiation implosion, would fission, heating and igniting fusion in the already compressed fusion fuel. The result, the "Teller-Ulam" design for a thermonuclear weapon, remains the standard design 50 years after it was invented. The stage was set for the monster, Mike. 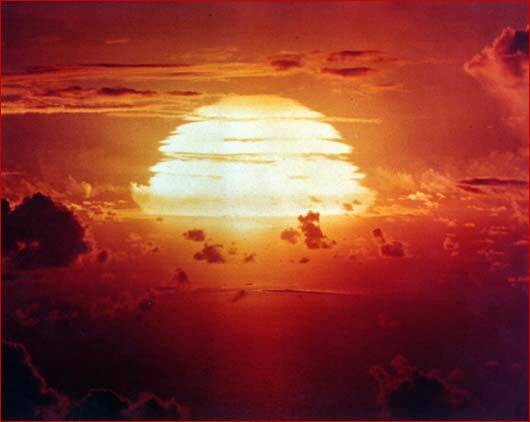 On Nov. 1, 1952, the world's first hydrogen bomb created a mushroom cloud 100 miles across and proved what physicists suspected - that while there was an upper limit to the size of fission bombs, hydrogen bombs could be made as big as you wished. Teller? Ulam? Who invented the "Teller-Ulam" design? ©2003, University of Wisconsin, Board of Regents.